The comprehensive range of Biometrics' goniometers and torsiometers are ideal for quick, simple, and accurate measurement of joint movement in multiple planes. Extremely robust, lightweight and flexible, the sensors can be comfortably worn undetected under clothing, without hindering the actual movement of the joint. Biometrics' sensors are sold separately or as part of complete measurement systems. Available systems include instrumentation for static angle readout, dynamic on line data acquisition in 2, 4 or 8 channel configurations, or fully portable data collection. Biometrics' goniometer F35 measures angles in one plane only. This smallest goniometer is designed to measure flexion/extension of finger and toe joints. The "SG" series twin axis goniometers simultaneously measure angles in up to two planes on movement. For example, to measure wrist movements, the endblocks of the SG65 or SG75 goniometer are attached on the dorsal surface using double sided tape, one end over the third metacarpal, the other over the midline of the forearm, with the wrist in the neutral position. The goniometer has two separate output connectors, one is measuring flexion/extension, the other radial/ulnar deviation. When used to measure a single axis joint such as the knee or elbow, or when measuring a single plane of a twin axis joint, simply connect one channel, the other remains redundant. All twin axis SG series goniometers function the same way, the difference being physical size. 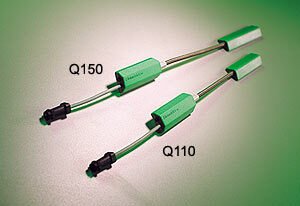 Biometrics' "Q" series single axis Torsiometers are designed for measurement of rotations in one plane, e.g. forearm pronation/supination or neck axial rotation. If the Torsiometer is bent in planes X-X or Y-Y the output remains constant. All Torsiometers function in the same way, the difference being physical size. 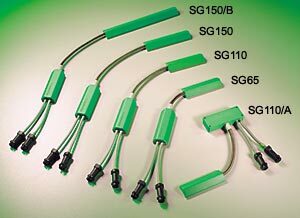 "J" series cables, available in various lengths, connect the "SG" series goniometers and "Q" series torsiometers to any of the Biometrics' instrumentation. One cable per channel is required. In general, there are no fixed rules governing which size of sensor is most suitable for a particular joint; this depends on the size of the subject. The sensor must be capable of reaching across the joint so that the two endblocks can be mounted where least movement occurs between the skin and the underlying skeletal structure. In certain circumstances more than one size of sensor will be appropriate. The SG75 is aimed specifically for simultaneous measurements of wrist flexion/extension and radial/ulnar deviation in the larger adult population. The following table is given for guidance only and refers to an adult population. Size used will vary within pediatrics. ¹Life test results have been collected by cycling the sensors through movements that would happen during everyday use. 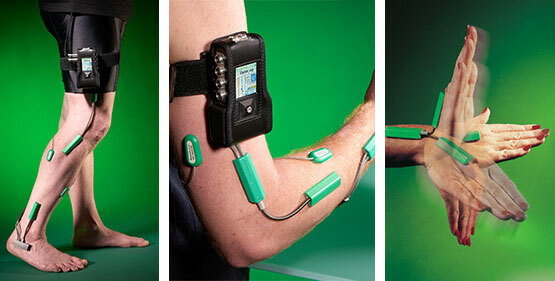 For example, placing a sensor on an adult elbow and moving from the neutral position to maximum flexion and back to the neutral position, the unit will function for typically 600,000 cycles. Due to many diverse applications of sensor technology, custom designed units may be designed and manufactured in volumes of one to several thousand. 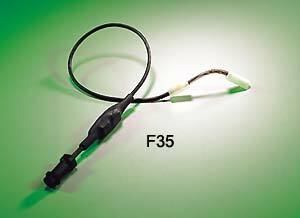 For example, waterproof sensors with integrated leads for use in pools or with underwater treadmills. Please contact us to discuss your specific application. F35, SG65, SG110, SG150, Q110, Q150, and DataLINK are trademarks of Biometrics Ltd.